Once there, Mary (Ruby Barnhill) is taken to Endor College (which, sadly, has no Ewoks), a school for magic lead by Madam Mumblechook (Kate Winslet) and Doctor Dee (Jim Broadbent), who immediately recognize her as a prodigy due to her incredible magic powers. But when Mary reveals that the powers come from the magic flower, it becomes clear that her hosts are not as kindly as they appear, and that the magic flower is something truly dangerous that, in the wrong hands, could do great damage to the magical world. 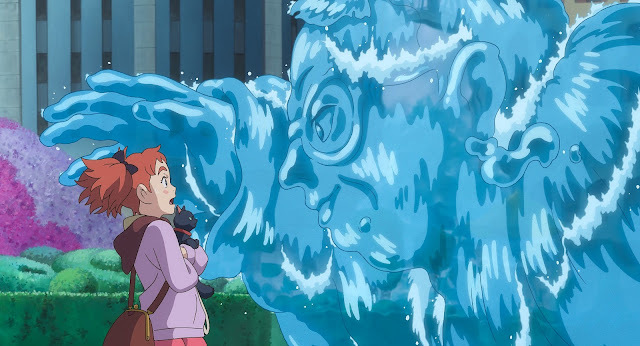 Mary and the Witch's Flower plays like a kind of "Ghibli's greatest hits," borrowing elements from Spirited Away, Kiki's Delivery Service, Castle in the Sky, and even Princess Mononoke, resulting in a film that never really establishes a personality of its own. On the one hand, it displays a disappointing lack of creativity for Studio Ponoc's debut feature. On the other hand, it shows they're playing it safe the first time out of the gate, sticking to tried and true story elements that have already been proven to work. That being said, it's an undeniably charming film, even if it's perhaps a bit overly familiar. It's a decently engaging adventure that hinges on the importance of embracing one's differences, and how the things we believe set us apart are often our greatest strengths. It's unfortunate, then, that a film about embracing one's own unique qualities is so lacking in, well, uniqueness. It's a fine amalgamation of stronger films, but it's hard to escape the feeling that we've seen this all done before. Still, Takatsugu Muramatsu's score is gorgeous and bursting with energy, and the animation is often breathtaking. In the English dub, Kate Winslet and Jim Broadbent are clearly having a blast, and young Ruby Barnhill (The BFG) makes for a plucky heroine. It's a solid start for the fledging Studio Ponoc, and one can only hope that it leads to bigger and better things, opening doors to take greater chances in the future. 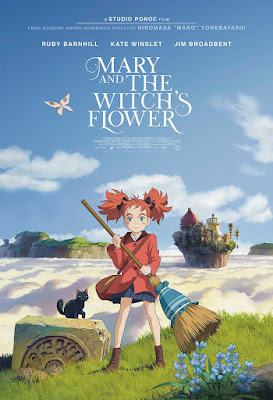 It's an enjoyable film, to be sure, but it lacks that certain creative spark that made Ghibli films so special. Hopefully Ponoc learns from Ghibli rather than just rehashing their older films, and becomes a new creative force in Japanese animation, filling the giant shoes left empty by one of animation's most venerable institutions. MARY AND THE WITCH'S FLOWER | Directed by Hiromasa Yonebayashi | Stars Ruby Barnhill, Kate Winslet, Jim Broadbent, Louis Ashbourne Serkis | Rated PG for some action and thematic elements | Opening in theaters nationwide on Jan. 18 for one night only via Fathom Events. Click here for ticket information.